In purchasing equipment for the outdoors, I always use the same thought process. How often am I going to upgrade my equipment based on the new radical improvements that the manufacturer will come out with? How long before my existing equipment will become obsolete and I will have to replace it? How long will it be before I have a disadvantage with my existing equipment? When the time came to choose camping cookware, I decided that I would choose the best camping cookware that I could afford based on the use of the camping cookware. The important considerations in choosing camping utensils and cookware are: Where you going to be camping, how long are you going to be camping and how many people do you have to cook for? There are a few material options available when choosing cookware & utensils and each one has its pros and cons. Aluminum: Aluminum cookware is less expensive, lightweight and consistently a good conductor or heat. Meals are usually not burnt because the aluminum cookware will simmer on low heat. Unfortunately, aluminum will dent easily and it is linked to health problems (with acidic foods) in the non coated sets. Stainless steel: Stainless steel cookware is more expensive, heavier and is not consistently a good conductor of heat as the aluminum (can burn food). It is much tougher than aluminum and doesn't dent as easily. Titanium: Titanium cookware is the most expensive, extremely lightweight and the toughest of all the cookware. It does not cook as consistently as stainless steel. Non-stick coatings: Non-stick coatings are only available on certain materials and certain cookware sets. The obvious advantage is that the food doesn't stick to the surface of the cookware, but it also scratches very easily. Once non-stick coatings are scratched, the coating doesn't work properly. Non-stick surfaces clean easily. Plastic utensils, plates, bowls, etc. Plastic is inexpensive, lightweight and a perfect choice for food containers and utensils. But be very careful as some plastics might retain the smell of the food. You can take as little as a knife, a spoon, something to clean the pot and as much as fork, serving spoon, spatula, etc. Based on where you going to be camping, how long are you going to be camping, how many people do you have to cook for and what types of meals served will dictate the types of utensils needed. The least amount of utensils are needed if you're planning on eating dehydrated or canned meals. Make sure you have something to pick up the pots with. The handles that come on the pots might break or become too hot to pick up. 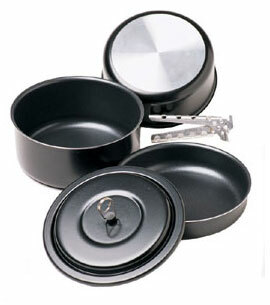 You can choose your cookware by purchasing a whole set and then selecting what to bring or purchase individual pieces. Each has its own pros and cons. Purchasing a set will be less expensive (but might be more expensive if you never use some of the pieces). Purchasing individual pieces will give you exactly what you need (but you might need other pieces at a later date). Cookware sets are designed to nest inside each other so less room is actually needed and the stove can be packed inside the smallest cookware so everything is in one place and protected. Lids can be plates or frying pans. Pots can be plates. Be sure to bring spice containers with you as spices will add to your meal flavor. Only bring what cookware you will really need, not what you think you might need. Just make sure you have a big enough pot to boil enough water when everyone wants a nice cup of hot coffee at the same time. Don't forget to learn how to maintain your camping cookware correctly because incorrect methods might damage your camping cookware and choose your camping cookware wisely.